Vyleta’s novels do not conform to any genre: they are vivid recreations of brutal historical milieus, espionage thrillers, police procedurals—The Crooked Maid contains a courtroom trial of an individual accused of parricide, while most of the novel is suffused with Gothic elements. Most significantly, all three novels explore how desperate people make decisions that may offer them material improvement or a degree of security but at the cost of rendering them morally bereft having abandoned the civilized values to which their societies aspired before the Nazi menace took hold. In post-war Berlin and Vienna, although the regime has collapsed, the moral rot lingers. 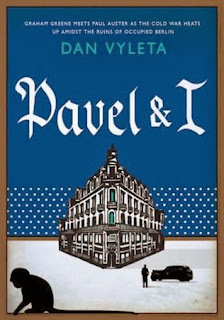 In Pavel it infects the characters whose instinct for self-preservation is rarely tempered by considerations of justice or even human decency. 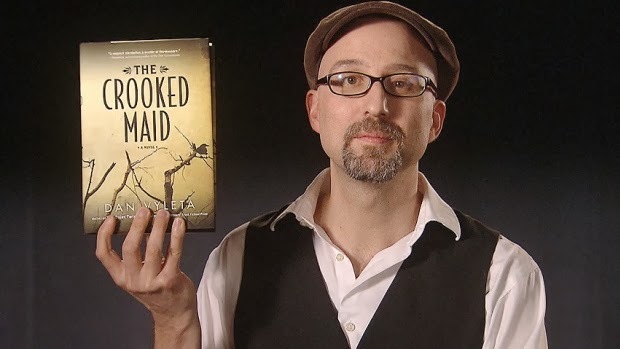 In The Crooked Maid, murders occur and although the trappings of justice are in place – a decent investigating officer and an ostensibly impartial court system – do not expect justice to occur in the moral gray zone that inhabited Austria after the war. In Pavel and I, the city is in ruins fractured by British, French American and Soviet occupation: its citizens face gnawing hunger in unheated apartments, and street gangs, the black market and rats hold sway. In the spirit of The Third Man, Vyleta's Harry Lime is the British Colonel, Fosko, an obese, sinister brute who resorts to torture and murder to achieve his goals. A soon-to-be-dead friend of Pavel Richter shows up at his flat with a dead German midget, folded in a suitcase, who had made a business of selling secrets. Fosko is desperate to track down a roll of microfilm sewn into the lining of the dwarf’s Russian overcoat. The microfilm is of interest to his Russian counterpart who is also eager to apprehend any German scientist in order to whisk him over to the Russian sector. Moreover, Fosko is a scoundrel who turns Sonia into his virtual slave by dangling in front of her the promise of a passport over her if she agrees to be his mistress, prostitute herself and spy for him. Fosko is clearly the villain and the reader is not disappointed when he meets his sticky end. So far so good but everything else is shrouded in mystery. We never find out what was contained in that microfilm, and there is the enigma of the titular character. Pavel is a decommissioned American soldier with a murky past who seems reluctant to return home, even though we learn he supposedly has a wife awaiting him. When we first meet him he is suffering from a kidney disease having taken refuge in a flat in the British zone and is attended to by Anders, an urchin from a street gang. 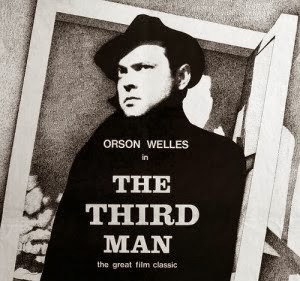 He finds Pavel penicillin on the black market, (another allusion to The Third Man) and Pavel reads him Dickens’ Oliver Twist in return, a novel that obviously resonates with the young orphan. Pavel is likely a spy but for whom? He seems mild mannered and capable of loving Sonia but he is on one occasion shown to be utterly ruthless. The situation is further muddied by an omniscient narrator, the I of Pavel and I. It is about two hundred pages before we learn that he is Peterson, another enigmatic but peripheral character, one practiced in the dark arts of torture and murder, and an aide to Fosko. Peterson acts as Pavel's interrogator when he falls into the colonel's hands, only to become intrigued with his prisoner as he attempts to untangle Pavel’s past and establish his identity and intentions. In the process, Peterson reveals an ambiguous loyalty to his superior. This filter leaves the reader once removed from the characters and the city itself. He is also handicapped by Peterson’s subjective responses which further restrict his understanding of the truth. It is as though we are navigating the literary terrain through a light mist: we can see the objects but everything is not in sharp focus. Vyleta wisely dispenses with this literary device in the subsequent novels and substitutes another one which works more effectively. 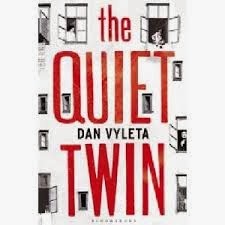 At the beginning of each section of The Quiet Twin, Vyleta tells a brief (italicized) story about a real, famous person that connects with the sociopolitical atmosphere in Vienna in 1939 which provides insight into the plot or characters within the novel. For instance, he relates the story of Herbert Gerdes who created the 1936 film, Erbkrank: the Hereditary Defective, filmed inside a German mental institution and shown in all five thousand German and Austrian theatres as justification for the extermination of the patients. This chilling narrative portends the potential fate that may be in store for several of the novel’s characters. Dan Vyleta’s The Quiet Twin offers a unique perspective on the growing menace of National Socialism in 1939 Vienna. Vyleta decided that he would not include the disappearance of Jews but focus on perhaps less well-known casualties of the Nazi regime. Also instead of creating Nazi zealots, he focuses primarily on seemingly ordinary characters living in a rundown apartment complex where a mass of sinister activities is occurring beginning with the murder and disembowelment of a dog. The violence operates as a microcosm for the brutality to come in which Austria became a willing partner to the horrors perpetuated under the Third Reich. The effect is that Vyleta creates an almost unparalleled atmosphere of fear, paranoia and dread reminiscent of Greene and the suspense of Hitchcock’s Rear Window. We are introduced to a reticent Dr. Anton Beer who specializes in forensic psychology and has read the banned books of Freud. Beer is asked to assist in the investigation by the detective Franz Teuben who initially masquerades as a patient before revealing to Beer’s horror his true identity. Beer has his own personal and professional secrets to protect and tries to avoid the importuning Nazi official. Other denizens of the apartment building include Professor Speckstein, the disgraced teacher and Nazi informant and his hypochondriac niece Zuzka, whose paralysis resembles one of Freud’s case histories on hysteria. When Speckstein asks Beer to look in on Zuzka, she reveals her penchant for voyeurism and has him look out at the courtyard behind them. There, as a metaphor for the state’s surveillance of its citizens, he can see the private lives of many of the residents through their windows: Anneliese, a hunchback, the ten-year-old daughter of an abusive drunk, with whom Zuzka “talks” in sign language; an amputee survivor of the Great War, who rarely leaves his apartment; an English teacher with an active “social life”; an Asian musician who plays the trumpet; the complex’s janitor, who conducts a strange business in the basement of the building; Otto Frei, a stealthy mime who practices at 3:00 A M.
The foot of a woman visible through the mime’s window particularly catches the attention of Beer and Zuzka. She turns out to be the woman of the title, Otto’s mute twin sister, Eva, who also suffers from an unknown paralysis. In acts of defiant compassion, Beer gently administers care to this emaciated, vulnerable woman—as well as the young Anneliese after her father dies—and attempts to protect her from the predatory Teuben. Her outside beauty, marred by her rotting inside, is perhaps a metaphor for Nazi Germany with its inner corruption overlaid with the desire for Aryan perfection. That “perfection” is put on ironical display at a dinner party for the local Nazi top brass hosted by Speckstein, an event whose aftermath forces this cast of characters to make split-second decisions that test their humanity and decide their momentary survival. Strangers living in the same building make decisions they would never have considered previously yet pretend that they are adjusting to the “new normal.” Their hidden faces—literally in Otto’s case—and multiple secrets, which, if revealed, could spell their doom in this New Order with its ruthless eugenics program, lends an even more claustrophobic air to the narrative, that is echoed by the very era which the novel is set. The Crooked Maid takes place almost a decade after the events in The Quiet Twin in post-war Vienna. Each section opens with an italicized overview that provides historical data about the horrors of the war and its aftermath. For example, Vyleta relates how at Stalingrad a colossal number of prisoners were taken and how few returned home. Among them are the “shabby, lost men…with vacant eyes” who now haunt the city, one that is largely in ruins, a condition that mirrors the psychic landscape of the novel’s characters, some of whom have appeared previously. Although Maid can be read on its own, I think that the reader would derive more pleasure and frisson if he has read the earlier novel. Robert Siegel, who made a brief appearance in Twin as detective Teuben’s little boy, is back from boarding school in Switzerland, called home to be by the side of his dying stepfather who fell or was pushed from a window. Robert’s home is now a dilapidated mansion, inhabited only by women: his drug addict mother who found it easy to absorb the ethos and benefits of Nazism—she became wealthy when her second husband’s wealth was amassed by a deal with a Jewish partner who had to sell his factory—and now is burdened by fear and guilt that this man will return and she will lose her fortune, his pregnant stepsister-in-law and the maid, Eva, who was once the innocent Anneliese, the hunchback, and now the cynical titular character of the novel whose experience in an orphanage has embittered her and yet given her the street smarts to exercise control over the household—including Robert who becomes attracted to her—in a way that belies her official station. Absent is Robert’s stepbrother, Wolfgang, a former Gestapo agent who, like so many other perpetrators, has “rehabilitated” his reputation and moved back home. At the time of Robert’s arrival, Wolfgang has been incarcerated on suspicion of being responsible for his father’s fall. A spectre hangs over the house as a mysterious vagrant in a red scarf watches them and fuels further fear for the Siegel family who contemplate sinister means to eliminate this threat and maintain their wealth. In the opening scene, Robert meets the older, world weary Anna, the estranged wife of Dr. Anton Beer, a psychiatrist, who at the end of The Quiet Twin had been conscripted and subsequently spent considerable time in a P.O.W. camp. According to rumour, Beer was released and has been seen recently in Vienna looking for Anneliese whom he came to love as a daughter years before. Anna is hoping to reconcile with her unfaithful husband but when she arrives at his apartment the only trace of him is fresh blood on the wall. She seeks out individuals for news about her missing husband, notably a dodgy, perpetually drunk Czech, Karel Neumann, who has keys to his place and apparently spent time with him in a Gulag camp, but the reliability or accuracy of his information remains suspect. Beer’s ghostly presence that haunts the novel is not all that dissimilar to that of Harry Limes, who for the most of The Third Man is presumed dead. Is Beer the strange man wandering the streets of Vienna in a red scarf? Has he been brutally murdered, found wearing a beautiful, hand-blown glass eye? Or, as cryptically suggested in the last few pages, is he still in a Soviet prison camp? Or is Vyleta being deliberately mischievous requiring the reader to assess the evidence and make up his own mind not only about the fate of Beer but whether Wolfgang killed his father? Austrian men became Nazis, went off to war, were brutal, and those who returned were expected to de-Nazify in quick order. From Vyleta’s narrative, it is highly problematic that they underwent a moral transformation and were able to achieve redemption. Nonetheless, he does offer a glimmer of hope. Late in the novel, the reader is informed that Beer’s application of “the talking cure” saved the life of the suicidal commander in his camp. And it is only a glimmer since the evidence from the real world suggests that the number who participated in war crimes and later sought redemption is, to put it generously, slight, a reality that Vyleta, as the author of a monograph on fin-de-siècle Austrian crime and the Jews, surely understands. His recent foray into fiction reveals a gifted writer whose creativity was marinated in his historical studies and the literary and cinematic culture of the UK and the continent.